Because getting waves of tokens for blowing up the board is pretty sweet! Hapatra has some combat damage triggered ability, but that is reeaaaaaaaally boring. Let's talk about her second ability, or the creation of snakes every time a creature gets -1/-1 counters. 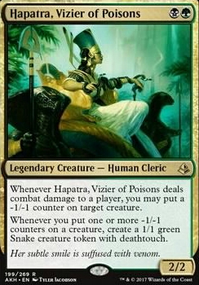 It's important to note that regardless of the number of -1/-1 counters placed on the creature, Hapatra creates a single snake per creature. While this balances the strength of Black Sun's Zenith, such considerations were not give to Flourishing Defenses and Nest of Scarabs. Doubling Season and Parallel Lives allows us to quickly amass an army of deathtouchers, while Beastmaster Ascension, Thunderfoot Baloth, Triumph of the Hordes, Eldrazi Monument and Garruk Wildspeaker all give the team a huge swing to overwhelm the opposition. Viscera Seer provides a sac outlet, which when combined with Mikaeus, the Unhallowed and Woodfall Primus allow us to destroy all lands. Mikaeus can also be substituted with Unspeakable Symbol in a pinch. Ulvenwald Tracker and Garruk Relentless Flip plus deathtouching snakes creates the dreaded "Snake Sniper", allowing us to down the largest of mortal creatures. Shaman of Forgotten Ways provides an alternate method to win, by drastically reducing everyone's life-total right before the sneaky sneks slither past their defenses for lethal. Grave Betrayal and Necroskitter recruit the dead into our army to make the game progressively lopsided as it drags on. I'll be sure to update the list as I tweak and optimize the build after some games at EDH night!